Interact with the applet below for a minute or two. After doing so, please answer the questions that follow. To explore this resource in Augmented Reality, see the directions (below) that follow the questions. Create a rectangular prism that has a length = 4 units, width = 5 units, and height = 3 units. How many square units (i.e. "squares") appear on 1 pink face? How many square units (i.e. "squares") appear on 1 gold face? How many square units (i.e. "squares") appear on 1 white face? Use your answers for (1) to determine the TOTAL SURFACE AREA of this rectangular prism. That is, how many square units, or squares, cover the ENTIRE SURFACE of this rectangular prism? 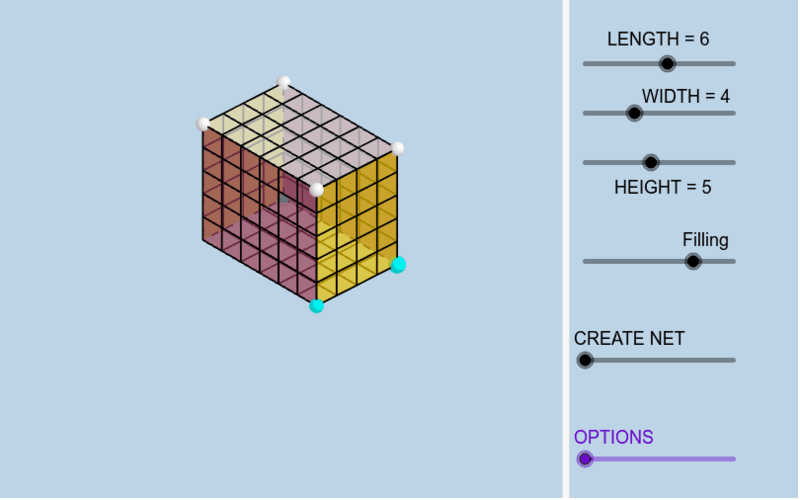 ﻿Now create a rectangular prism that has a length = 8 units, width = 3 units, and height = 5 units. Use your answers for (3) to determine the TOTAL SURFACE AREA of this rectangular prism. That is, how many square units, or squares, cover the ENTIRE SURFACE of this rectangular prism? Without looking up anything on another tab in your internet browser, describe how we can determine the total surface area (number of squares) that cover the entire surface of this rectangular prism. Be specific! 1) To explore in Augmented Reality, open up GeoGebra 3D app on your device. 2) Go to the MENU (horizontal bars) in the upper left corner. Select OPEN. In the Search GeoGebra Resources input box, type fmbmkpj7 (Note this is the resource ID = last 8 digits of the URL for this resource.) 3) In the resource that uploads, zoom out and/or adjust the LENGTH, WIDTH, & HEIGHT sliders to create a prism with dimensions you like. 4) Additional Notes: The slider named "openclose" will cause the rectangular prism to fold out into its net. The slider named "options" will cause different faces of the prism to appear and disappear. The slider named "Filling" will change color opacity of each of the faces.